For a truly unique and luxurious experience, stay at a hotel that features underwater rooms or even an underwater restaurant. 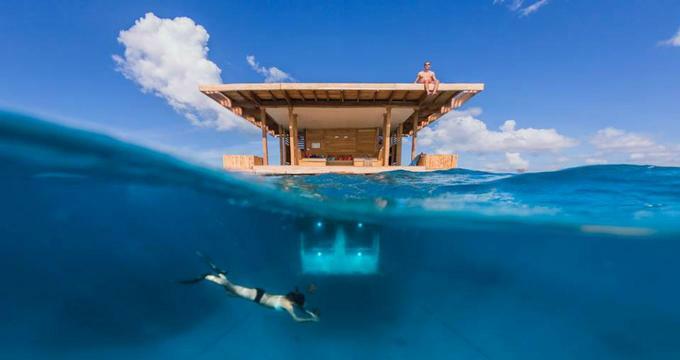 Some of these hotels are located along the ocean and simply have a restaurant that allows you to dine under the water, while others even have underwater rooms. The common theme is that these are all high-end hotels and restaurants that will attend to your every need while you experience the unique opportunity to view marine animals you wouldn’t normally get to see. Conrad Maldives Rangali Island lets guests choose from accommodations on two different islands. Villas have amenities like air conditioning, connecting rooms, night lights, TVs with cable and premium channels, clock radios, bath slippers, duvet covers, feather pillows, chaise lounges, seating areas with sofas, coffee makers, internet access, phones, hairdryers, and more. There are also Deluxe Beach or Water Villas as well as other Water Villas along with Beach Suites. Many have floor-to-ceiling windows and even private island hosts. The best place to dine at this resort is the Ithaa Undersea Restaurant, which is 16 feet below sea level and the only undersea restaurant that is all glass, giving you 180-degree panoramic views of the underwater world. This restaurant serves European cuisine in the form of a six-course dinner menu or a four-course lunch menu. There are a total of four bars and eight restaurants. After enjoying a meal at the undersea restaurant, guests can visit the open-air cinema, the watersports center, the dive center, the fitness center, the two spas, or the three boutiques. 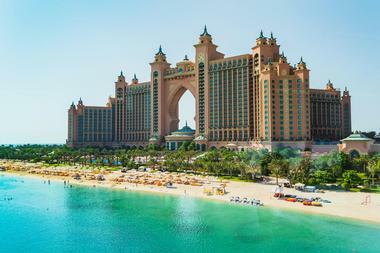 Even the name Atlantis gives you an idea of the water features on display here, and Atlantis The Palm, Dubai prides itself on offering high-quality service and a range of room types. The Deluxe Rooms have balconies, spacious bathrooms with separate baths and walk-in showers, mini bars, cable and satellite TV, two queens or a single king, 24-hour room service, free wireless internet, and room for four people. Some rooms also have uninterrupted views of the Arabian Sea or The Palm. The Imperial Club Rooms add luxury and amazing views along with benefits like a dedicated concierge team and private check-in. Those staying in Imperial Club Rooms have access to the Imperial Club Lounge with complimentary evening drinks, afternoon tea, and breakfast along with complimentary access to the kids’ club. Those staying in Deluxe Rooms can also opt for a bed-and-breakfast package. Otherwise, take advantage of the 23 different restaurants on site, including Ossiano, which serves award-winning seafood in an intimate dining atmosphere, and Poseidon Café. Both restaurants are underwater and have views of the Ambassador Lagoon. The Atlantic also has the Aquaventure Waterpark and the ShuiQi Spa and Fitness Center. 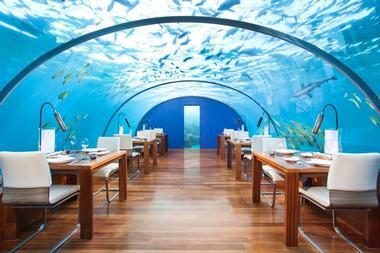 The Manta Resort provides five-star luxury on a tropical island and stands out with its underwater room. This particular room is a one-of-a-kind private floating island with the bedroom sited four meters under the water’s surface. There is also a top deck for sunbathing or stargazing along with a water deck for dining or lounging. Those who want something a bit less special can stay in a Sea Front Villa with king-sized beds, en-suite bathrooms, secluded sun terraces, and air conditioning. There are also four Superior Garden Rooms that are perfect for families since they can be interconnected and feature private terraces, air conditioning, and king beds. Standard garden rooms are also fully inclusive, but have a fan instead of air conditioning. The resort offers safari, honeymoon, or Pemba Explorer packages to help guests make the most of their stay. Sunbathe on a lounger by the beach, learn to dive in the two-tiered pool, or swim off the beach. Guests can dine in their rooms, including on the deck of their underwater room, or on the resort’s main verandah, on the beach, or by the pool deck. There is also a Beach Lounge for cocktails along the water. This resort also provides relaxing treatments at its Kipepeo Spa. PER AQUUM Niyama Maldives is the perfect place for relaxation and features underwater dining at one of its many restaurants. It is ideal for families, romance, or active couples. Each villa at the resort has its own secluded deck for privacy, and inside you will find a king bed, a full-sized fridge stocked with gourmet treats, LED TV and in-room entertainment, Bose surround sound, and butler service. You can even choose a studio with a private pool or one of the pavilions with living and dining rooms, outdoor Jacuzzis, and beach. The Family Beach Pavilion has three bedrooms, a spa treatment room, a Jacuzzi, two pools, and living spaces. The Crescent has 5 villas for as many as 14 adults plus 8 children. The biggest news for those who love the sea at PER AQUUM is Subsix, their underwater restaurant with a three-tier staircase and Italian abstract chandeliers along with amazing views through the floor-to-ceiling windows on all sides overlooking the underwater scenery. There are other options for fine dining or dishes from Asia, Africa, and the Americas as well as several bars. Guests have access to the water where they can swim with dolphins, go jet skiing, use a wakeboard, or go snorkeling. There is also a children’s club and the Lime Spa provides plenty of indulgences. Resorts World Sentosa is actually a resort made up of several different hotels and restaurants plus activities, all in one convenient location. The Ocean Suites are the biggest news for guests, particularly if they want underwater accommodation. These are essentially two-story deluxe townhouses with a Jacuzzi and outdoor patio on the upper level and underwater views on the lower level in the privacy of your own suite. The rooms have sunken Jacuzzi bathtubs in addition to the outdoor tub, Simmons “Cool Max” mattresses with premium 400-thread-count sheets, two 50-inch plasma TVs with cable and movies, a sofa bed, an iHome docking station, wireless internet, irons, electronic safe, slippers, shoe horns, Nespresso coffee makers, and minibars. The suites are located beside one of the biggest aquariums in the world, where you can see more than 40,000 marine fish. Staying in one of the eleven exclusive Ocean Suites also includes a personalized butler service and ferry service to the nearby Adventure Cove Waterpark and S.E.A. Aquarium. You can also access the 24-hour butler services, laundry and dry cleaning, and in-room dining as well as swimming at the Beach Villa’s pool and the gym at ESPA. The Radisson Blu in Berlin offers 427 rooms plus suites that come with comfort and a contemporary style, surrounded by aquatic views. Guests receive high-speed wireless internet, tea and coffee, connecting rooms, allergen-free rooms, mini bars, individual air conditioning, and premium movie channels. Many rooms also include a Super Breakfast Buffet at the HEat restaurant, bathrobes, slippers, two LCD flat-screen TVs, bathtubs with separate showers, leather armchairs and couches, Jacuzzis, guest bathrooms, dining rooms, kitchens, and a living room. Many people choose to stay at the Radisson Blu or just have a drink at the underwater Atrium Bar. This area is known as the AquaDom and stands 25 meters high, making it the largest cylindrical aquarium in the world with 1,500 tropical fish and 1 million liters of salt water. The Atrium Bar sits at the base and is perfect for a sweet treat, coffee, or an alcoholic beverage. The on-site restaurant, HEat, has a waterfront location and an open-show kitchen along with a private dining room. This hotel also has a gym, pool, and spa with fitness center plus concierge services. Nathan Outlaw at Al Mahara is at the Burj Al Arab Jumeirah and enables diners to enjoy a delicious seafood menu underwater with views of fish swimming by. Expect modern British seafood with a four-course dinner, three-course lunch, and signature tasting menu. For those who prefer to eat on the patio, you can also have caviar and oysters. The underwater dining, however, is ideal for most guests as it is a unique experience with floor-to-ceiling windows that give you views of the expansive sea and the fish swimming within it. In addition to the unique underwater dining experience, this stunning hotel has a distinctive silhouette with suites featuring check-in inside the suites, a private reception on each of the floors, and personal butlers. There are 202 luxurious suites in the duplex style along with five swimming pools and nine world-class restaurants including Nathan Outlaw’s. Guests can relax in the Talise Spa, drop off their children at Sinbad’s Kids Club, visit the private beach, two indoor pools, or three outdoor pools, or use the Talise fitness center. Guests also receive complimentary access to the Wild Wadi Waterpark. The 10,000-square-meter rooftop terrace has excellent views with a beach, pool, restaurant, and cabanas. Hotell Utter Inn translates to Hotel Otter Inn and is a unique, floating, underwater hotel that was conceived by Mikael Genberg, a local artist. It is a quick boat ride from the nearby Vasteras harbor and offers relaxation on the 25-square-meter deck and easy access in a dinghy to nearby uninhabited islands. The bedroom is the star of the show as it is three meters beneath the water’s surface and has panoramic windows in every direction. Above the water’s surface, you will find a fully equipped kitchen with crockery, a hot plate, a fridge, 10 liters of fresh water, and a dry toilet. Although this inn doesn’t have electricity, it does have portable lighting and a gas heater. You cannot fish from it, however, so keep that in mind. Because of its location, it is only open from April to October. For those who want to experience an underwater lodge without a high price tag or the need to travel around the world, Jules’ Undersea Lodge in Key Largo is the perfect option. This is the only underwater hotel in the world and is right in the lagoon at the Key Largo Undersea Park. You can choose to stay for just three hours or a full day. To get to the lodge, you have to SCUBA dive 21 feet under the sea, a unique experience in itself. The round 42-inch windows provide guests with an amazing view of the fish swimming by. You arrive at an opening by the bottom of the lodge’s habitat, but you won’t lack comforts. There is a fully stocked kitchen, which has a microwave and fridge, as well as hot showers, cozy beds, movies, books, music, and lots of fish. Because you have to dive to reach the lodge, guests must be certified SCUBA divers to stay here or take a Discover SCUBA course when they arrive for safety purposes. Those who come for just the three-hour stay will get a pizza lunch while the overnight stay includes pizza for dinner along with snacks, water, soda, orange juice, cereal, tea, and coffee.